With Pill Pockets, there's no more forcing a pill down your pet’s throat. 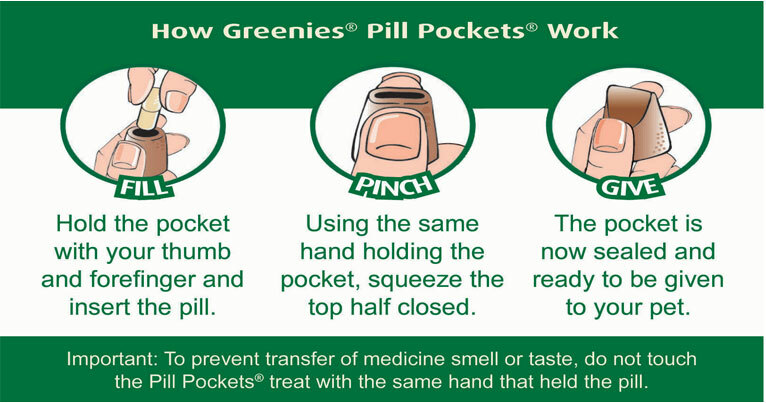 This patented pill pocket treat allows for easy insertion of pills and supplements. Made with a formula that’s healthy and high quality, Pill Pockets are supportive and contain nutritionally beneficial ingredients. Perfect for cats who shy away from taking pills. These treats will leave you and you pet smiling. Pill Pockets comes in a yummy salmon flavor to satisfy your kitty’s taste buds. Buy today and make pill taking a treat for your pet. Salmon Flavor: Wheat Flour, Chicken Livers, Glycerin, Salmon, Corn Syrup, Pregelatinized Corn, Salmon Oil, Water (sufficient for processing), Wheat Gluten, Gelatin, Natural Flavor, Starch, Salt, Lecithin, Potassium Sorbate, Ascorbic Acid, Sodium Phosphates, Probiotics (Lactobacillus Acidophilus, Lactobacillus Lactis, Lactobacillus Casei), Vitamin E Supplement, Natural Antioxidants. Feeding Instructions: Feed as Treat. If you read my comment on the other product, this is the same dog, which I have veterinary prescribed med for. I bought this product here for the price, it is very competitive in the market. Merchant Response:Glad you like it. 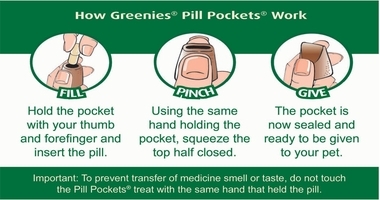 Pill pockets are so popular. Thank Bill. 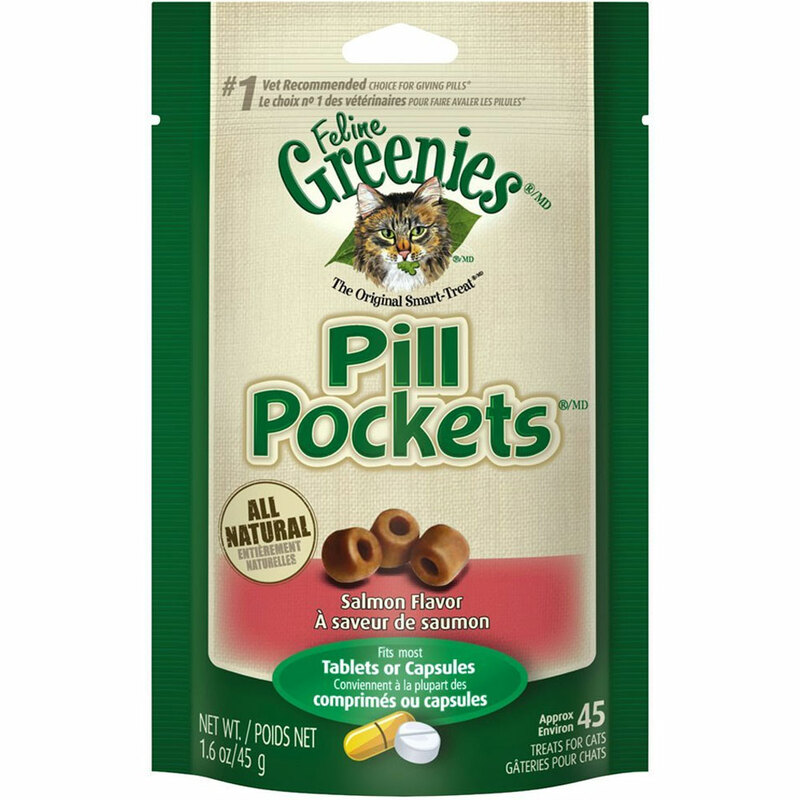 I was really apprehensive about this product as my previous cats stuck up their noses at them, but pilling my 2 cats daily got to be very tedious, and a friend suggested I'd try the pill pockets. So I did, I am dividing one up each day and put a small pill in for each of my cats, then kind of roll and squish the pill pocket to make it into a little ball. My cats gobble them up before breakfast, and, voila, no more anxiety about giving them pills. ProsThey can be easily divided to make smaller pockets. Much more reasonable price than at a regular pet store. Whoever invented these deserves the Nobel Prize! Giving medicine to my cats is now a pleasure, rahter than the war that it used to be!